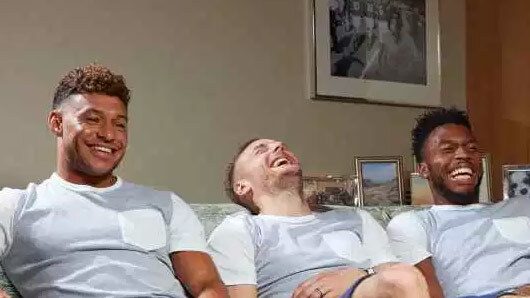 England football stars Jamie Vardy, Alex Oxlade-Chamberlain and Daniel Sturridge will appear on an upcoming special episode of Gogglebox. The international footballers are appearing as part of a special edition of the show in order to raise money for Stand Up For Cancer next Friday. Leicester striker Vardy said the boys were “fans of the show” and “can’t wait to join the Gogglebox families”. Arsenal winger Oxlade-Chamberlain added: “With one in two of us developing cancer in our lifetime, it’s so important for us to join together and do as much as we can. The England team recently received criticism for their performances in the World Cup qualifying game against Slovenia last Tuesday, which ended at a frustrating 0-0. However, nobody can criticise the boys for making a real effort for Stand Up For Cancer, which is a fundraising campaign by Channel 4 to raise money for Cancer Research UK. To find out more about Stand Up For Cancer, get involved or to donate to the cause, please follow this link.